By the time freshman Austin Pyrch graduates, he wants to have his name up on the record board at the Smith Center pool. 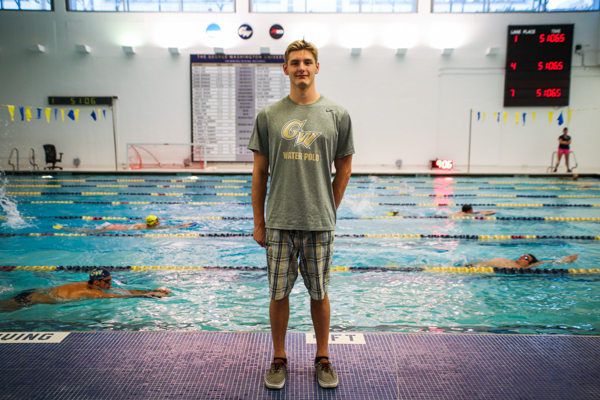 Pyrch is the only student athlete at GW to compete for both the water polo and swimming programs. Freshman Austin Pyrch’s Monday consists of two practices. He gets out of swim practice in the morning and then has to prepare his mind and his body for the water polo practice later in the day. Pyrch stands out because he is the only athlete at GW that competes in both water polo and swimming. Between both practices and games, the hours add up, but he takes the challenge head-on because staying busy with sports has always been something he is used to doing. Playing two sports makes Pyrch’s schedule a demanding one. He replaces two water polo dry-land practices each week with three swim practices and barely fits within the NCAA’s 20-hour-a-week practice limit. Still, he says he loves what he is doing. “You have to run in football, but it is a totally different sport,” he said. Swimming keeps the body “horizontal,” Pyrch said, and pits an athlete against the clock. Water polo keeps players more upright and is more physical. And mentally, it puts athletes up against opponents as members of a team. The differences between playing goaltender and center defender in water polo are also surprisingly substantial. The people closest to Pyrch, though, were not surprised when he decided to play multiple sports at GW. His older sister, Mikaela Pyrch, is a graduate student at GW, a current member of the women’s water polo team and a former member of the crew team. The Pyrch family overall operates around sports. Austin Pyrch and Mikaela Pyrch’s parents, who were both college coaches, encouraged them to try and compete in several different sports. Their father is currently the diving coach at Brown University. Growing up, they moved from Connecticut to Minnesota to Denton, Texas, where Austin Pyrch went to high school and was selected to the all-state swimming team as a senior. He and Mikaela Pyrch used sports to make friends and get “into the culture” of new places. Athletics also brought their family closer together. “It’s a big family thing, something we sit down and connect over,” Mikaela Pyrch said. Because of their age difference, this is the first year Mikaela Pyrch and her brother have been at the same school at the same time. Mikaela Pyrch, then a senior, was on the road with the water polo team last year when she found out her little brother would be joining her at GW. She was so excited that, by the end of the trip, the rest of the team made a joke out of teasingly asking if it was true that her brother was going to GW. She’d made sure they all had heard the news well before then. Austin Pyrch described their bond as “best friends on top of being brother and sister,” and said that people often think they are twins because they share the same laugh and mannerisms. He said that the decision to play two sports was his own, but that his sister’s experiences on different teams at GW helped him feel more comfortable with the idea. “I’ve always looked up to Mikaela, she’s always been a role model for me,” he said. He added that it’s been helpful to have his older sister around for advice during his freshman year, and said it is comforting to have someone to help him with little things like directions to J Street while he adjusts to a demanding schedule. So far, Austin Pyrch has succeeded as one of the water polo team’s many young contributors. He’s played a key role as a goaltender and has racked up 34 saves and a 43.6 save percentage against strong competition. In the field, he scored his first career goal against a ranked Bucknell squad on Sept. 26. He wants to leave his mark, literally, on GW by getting a record up on the board in the Smith Center pool. He swims freestyle, butterfly and backstroke and he holds high school records in all three. He’ll have a chance to get started when the swimming and diving team has its first home meet on Nov. 7. He played his final home game with the water polo team in the Smith Center pool on Wednesday night in a loss to Navy. The water polo season is not yet over, though, so the young multi-tasker will have to continue preparing for the swimming season while keeping his mind on the water polo games at hand. All statistics current as of Oct. 6. This article appeared in the October 8, 2015 issue of the Hatchet.